Mobile business budgeting: Surprisingly, fewer business owners and managers are equipping their people with mobile devices this year over last, according to a 2nd yearly poll from Sage, with barely half of those firms responding (54.5%) providing their staff with smart devices, down from nearly 70% in 2013. Mobile business budgeting survey responders are experiencing the positive results of mobile technology, however, with the largest impact in customer service, according to 70% of the 1,090 U.S. small companies surveyed. They also reported that smart devices are helpful for performing business in inclement weather (32%), delivering more work to the business (21%) and facilitating them to conduct remote meetings (20%). In spite of these advantages, most SMBs (over 75%) indicate that they are not budgeting for mobile devices, rather purchasing them as the need occurs. 5% said that their company sets a yearly budget for mobile items and adheres to it and 12% set their annual budget and then adjust expenditures as needed. 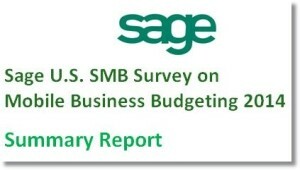 “The Sage Mobile Business Budgeting Survey shows that mobile technology makes doing business easier, empowers superior customer service and increases productivity,” stated Joe Langner, executive vice president and general manager of mid-market solutions for Sage North America. “With important business functions like customer contact being conducted primarily on mobile devices, business owners are finding ways to take advantage of technology and are seeing mobility make a true impact on their business.” Other interesting findings to the mobile business budgeting poll, conducted by Sage between April 18 and May 4, 2014, among an independent group of SMBs include: More than 50% of the survey respondents personally use a mobile device to access work-related information remotely (when away from the office or their main computer). Roughly 40% of respondents who use mobile applications are using a business-related application on their smart device (other than a laptop) that connects to the cloud. Staffs most typically use mobile applications for checking their email (96%), text messaging (84%), managing contacts (79%) and their calendar (71%), documents (65%), banking (60%) and social media (55%).